Monograph is a presentation of research papers prepared for V International Scientific Confer-ence AIR 2014 which is annually organised by Department of Labour Market Research and Forecasting and Department of Statistical and Mathematical Methods in Economy at University of Economics in Katowice. Authors of presented research papers are mainly research workers and PhD students of prominent scientific units and schools in Russian Federations and post-Soviet Republics. 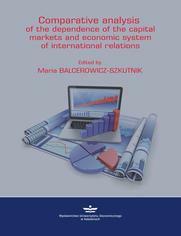 Papers included in monograph contain very varied aspect of capital markets analysis and eco-nomic systems problems. Many of them contain geoeconomic view on international relations. It is partly because of scientific interest of authors, but mainly is conditioned by mechanisms cov-ering Circuits and Republics of Russian Federation with external environment. Numerous con-tacts with Arabic and African states are typical for Russian international relations analysis. Theme multithreading suits the main conference profile perfectly, which allows to enlarge the concept of international relations to new and wide areas.